Pretzel Logic's Market Charts and Analysis: Nine Straight Advances, Can Bulls Make It Ten? Nine Straight Advances, Can Bulls Make It Ten? Yesterday, the Dow beat the odds and posted its ninth straight advance, the first time this has happened in nearly 17 years. Although that makes for a great headline, the raw statistic by itself is slightly misleading, because yesterday the Dow did not actually beat the intraday high of March 12 -- it simply closed higher than it opened. In any case, November 1996 was the last occurrence of nine consecutive green closes (that particular streak then extended to ten advances). Since 1973, the Dow has only put together nine or more straight advances on six prior occasions, so this is an extremely rare event. The record is thirteen straight advances, back in January, 1987 (an interesting year for equities!). Before I begin presenting the charts: if you're new to technical analysis (and to Elliott Wave Theory in particular) and thus don't believe it could possibly have any relevance for projecting the market's future, then please take a moment to read this primer article wherein I briefly outline a few of the tangible ways it relates to the markets. And while I'm discussing other articles worth reading: if you've not yet read Todd Harrison's 12 Cognitive Biases That Endanger Investors, I highly recommend it not only for trading, but for life in general. It's one of the best trading articles I've read in years. Let's move on to the charts, since, as they say, a picture is worth a thousand words (I've always wondered though: if you were to take a photograph of one word, is it still worth a thousand words?). Below is the monthly chart of the Dow, which is loaded with annotations and notes, and discusses several relevant levels and patterns. 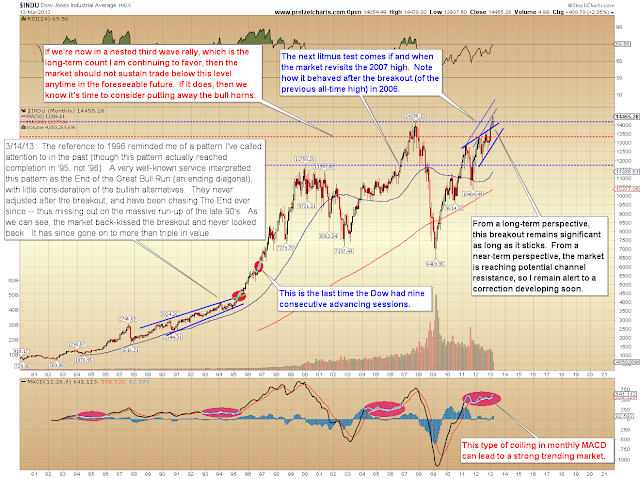 The main thing I wanted to again call attention to on this chart is the pattern which completed in 1995. 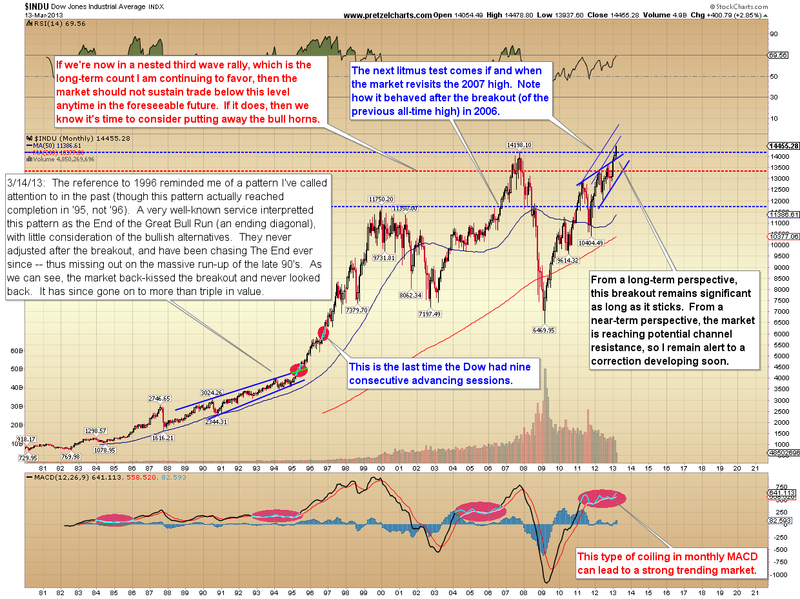 At the time, that pattern looked pretty convincing as a possible end to the bull market. But as I've warned previously, these types of patterns can either be ending patterns, or compression patterns which lead to a sustained bull move. My impression for the last several months has been that we're seeing the latter unfold. 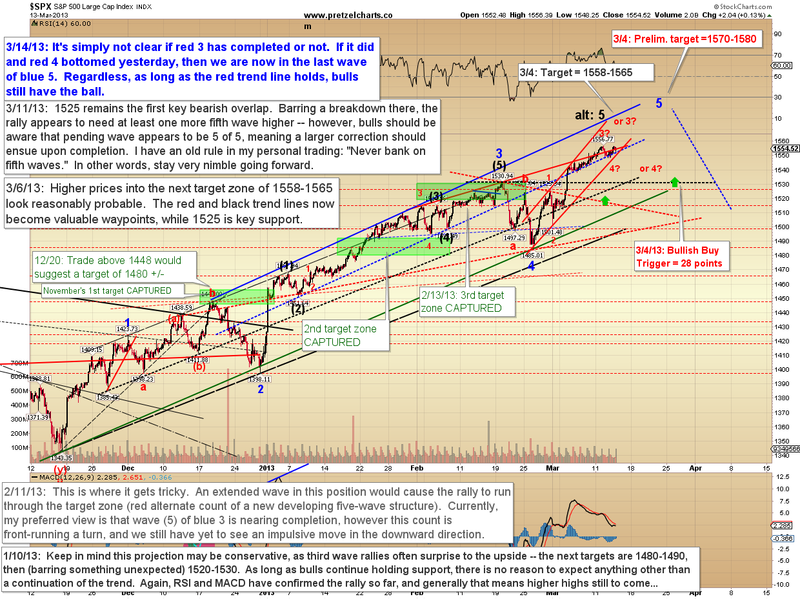 More and more, the current market is reinforcing that view, particularly on the Dow. The 10-minute chart of the S&P 500 (SPX) contains some new details regarding the near-term. I've studied the short-term structure on the one-minute charts, and frankly, the pattern is a complete mess and very hard to decipher. While this is a market that has paid the trend-followers, it's also the type of market that can lull bulls into a deeply-complacent slumber. My suggestion is to stay very alert at times like this, since the wave structure appears to be closing in on completion -- but at the same time, avoid the temptation to get too far ahead of the market. In other words, respect the wave counts as potential warnings, but honor the basics like trend lines and support/resistance levels. Every system runs into limitations, so when the wave structure gets this fuzzy, it's important not to give back profits chasing low-probability plays. Sometimes doing nothing is the most productive thing we can do. If one feels they can get a good risk/reward proposition even when things are unclear, then one must limit their risk accordingly for the equation to work. For example, sometimes when I'm trading euro/usd, I'll play a breakout to see if momentum will carry the market up and away from a very tight stop -- but I won't let that play turn into a long-term position. If I get stopped for a small loss, then I accept that and wait for the next opportunity. If the market makes a new high directly, it's a bit more probable that we're still in red wave 3, but this is where I would tighten my stops on longs, since the potential exists that the market is moving to wrap up the larger blue wave 5. In conclusion, the blue wave 5 target continues to remain active from a larger perspective, but the short-term picture is more than a bit hazy. So I’ll continue watching for a turn in the near future, but would not necessarily suggest front-running one. Trade safe. Great quote by Ortega y Gasset -- what book or work is it from? +1 on the Ortega y Gasset quote. Also on the Todd Harrison read. Excellent material. Looks like the answer is yes. Now lets see if the DJIA can make it to 11 straight advances. Thinking that tomrrow the SP500 will break the 1565 mark. Thank you for the Todd Harrison article. 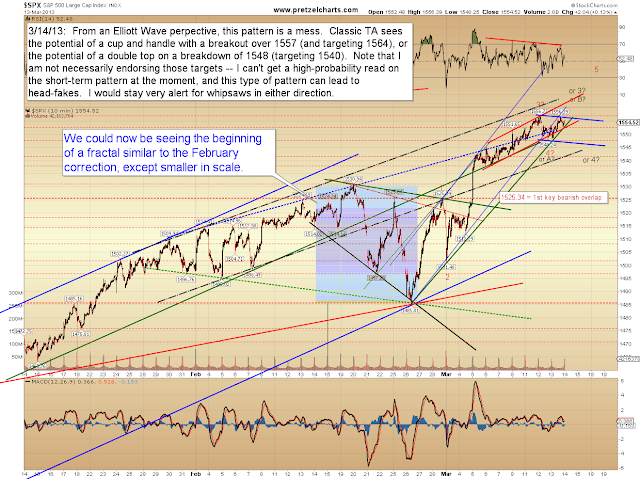 Thanks for the link to the two articles on Elliott Wave Theory. The second article indicated that there we more articles in this educational series. Are they available someplace else?